Happy Wednesday sweet friends! These last few weeks have been nothing short of crazy, but I have been amazed to learn just how resilient and adaptable my little crew is. Little Cute has been so sweet lately amidst all of the changes and chaos we have going on, and continually entertains us with her larger than life personality. Lately, she has been all about the princesses. At the beginning of Spring she discovered the magic of Frozen, and whenever she gets a chance she dons her princess crowns, jewels, and dress up gowns. She makes me smile when I see her walk in the room wearing her princess gear. I love it, and even encourage the occasional outing in which she can fashion her tiara (because who wouldn't want to wear a tiara out and about?) and sport her sparkly heels. Showing me her princess muscles! Because L.C. has been such a trooper lately I decided to surprise her with fun little gift. A few months ago, Carrie Beth and I had gifted the boys personalized books from i See Me. The boys were so excited about receiving their books containing their very own personalized adventures - and still ask us to read them almost daily. What you didn't see though was when we gave the books to the boys, L.C. broke down in tears because she wanted a story of her very own, too. She didn't quite understand why Cute and Boo Boo had their pictures in a book and she didn't. We felt so bad seeing her sweet two year old face heartbroken. Now she quickly forgot about the moment, but when I was thinking of what to surprise her with one day instantly the i See Me books were what popped into mind. Once I saw the Princess All-In-One Gift Set I knew it would be the perfect surprise for her! 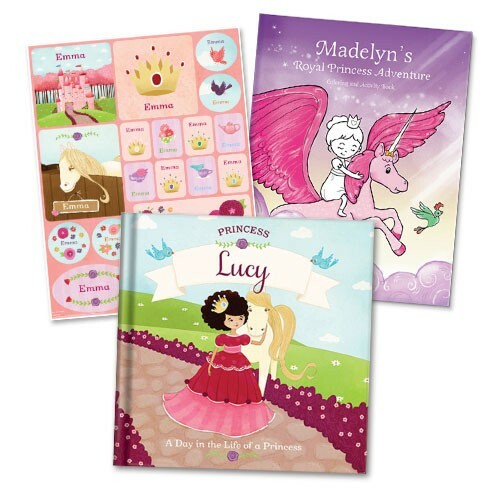 Not only does it contain a personalized princess book, but it also contains personalized stickers and a personalized coloring book as well. With all the traveling we have been doing lately I knew she would love being entertained by the stickers and coloring book. Just as when we did the boys' stories, I was able to quickly put together a story filled with personalized details from names to cities to physical attributes, and even a fun note from Mr. Cute and I. The turn around time for the products was just over a week and I was giddy with excitement to give it to her. When she came home from school I let her open it and at first she didn't know what to think, but the moment she saw that it was a book with her name on it she was over the moon excited! She couldn't believe she had her very own story just like her big brother had - and even better, stickers and something to color on. To say she was happy was an understatement. She loves looking at the pages and quickly pointed out all of the special personalized details. One of her favorite parts of the story, is where the she realized she had a horse named Elsa in the story. Her Frozen fever being fed even more. Her photo can be found several times throughout the story. I think as young as she is, it makes the story a little more fun since she can look through the pages and see "her" book until she is able to read the words on her own. The stickers actually came in handy for back to school. Considering you have to label anything and everything that goes to school, the stickers were a fabulous way to check that task off my list. I let her pick what she wanted to put her princess stickers on and she made me laugh when I saw she put one on her lunch box insert. I love that I was able to surprise my little princess with a special story of her own - one I know she will be able to cherish for years.